The Emperor Maximilian diamond gets its name from Ferdinand Maximilian Joseph, the Archduke of Austria and the younger brother of Emperor Francis Joseph of Austria (1848-1916), who by an international intrigue was placed on the throne of Mexico in 1864, that eventually resulted in his execution. Maximilian Joseph purchased the 41.94-carat diamond while he was on a botanical expedition to Brazil in 1860, and the diamond came to be known as the Emperor Maximilian diamond. He also purchased another 33-carat diamond, which was named the Maximilian II, sometimes known as the "Carlotta Diamond", after his wife Princess Charlotte, to whom he presented the diamond. The Emperor Maximilian diamond is a 41.94-carat, near colorless, cushion-cut diamond, with a VS-1 clarity. According to the GIA color grading system near colorless diamonds can have a grading of G, H, I or J. The Emperor Maximilian diamond falls within the I-color range. An important characteristic of the diamond is the strong blue (somewhat violet) fluorescence shown by the stone in natural daylight, which tends to reduce any yellow tinge in the diamond. The I-color grading of the diamond and the blue fluorescence suggest that the diamond is a Type Ia diamond, which constitute almost 98 % of all naturally occurring diamonds. In Type Ia diamonds nitrogen atoms are found as aggregates of 2, 3 and 4 atoms, known respectively as A-aggregates, N-3 centers, and B-aggregates. A and B aggregates do not absorb visible light and therefore do not affect the color of the diamond. N-3 centers do absorb visible light in the blue region of the spectrum, causing its complementary color yellow to appear. A-aggregates also quench fluorescence, but B-aggregates and N-3 centers do not. Thus Type Ia diamonds are sub-divided into three groups. 1) Type IaA - Nitrogen atoms occur as A-aggregates. The diamonds are colorless and do not show fluorescence. 2) Type IaB - Nitrogen atoms occur as B-aggregates. The diamonds are colorless, but shows strong fluorescence. 3) Type IaAB - Nitrogen atoms occur as A-aggregates, B-aggregates and N-3 centers. The diamonds vary in color from very faint yellow to medium yellow, and shows a medium to strong fluorescence. Thus the Emperor Maximilian diamond is most probably a Type IaAB diamond. The strong blue fluorescence shown by the diamond tends to reduce the yellow color of the diamond, making it appear somewhat whiter. The diamond is of Brazilian origin, and was purchased by Ferdinand Maximilian Joseph, in 1860, when he made a trip to the Brazilian rain forests in pursuance of his Botanical studies, a subject that had fascinated him since his childhood. It is not certain where the diamond was cut and polished, but in all probability it must have been in one of the diamond cutting centers in Europe, such as Antwerp or Amsterdam, as there were not many established diamond cutting centers in Brazil at the time. Maximilian Joseph also purchased a second diamond, which was a 33-carat stone with a greenish-yellow tint, which he later presented to his wife Princess Carlota, the daughter of Leopold I, the king of Belgium. Princess Carlota wore the diamond as a pendant to a necklace. Ferdinand Maximilian Joseph, who was born at Schonbrunn Palace in Vienna on July 6th 1832, was the second son of Archduke Francis Charles of Austria and his wife Sophia, daughter of King Maximilian I Joseph of Bavaria. His elder brother Francis Joseph was the Emperor of Austria from 1848 to 1916. Maximilian Joseph showed a keen interest in the sciences from an early age, and had a fascination for the natural sciences particularly Botany. In 1851 at the age of 19, he joined the Austrian navy as a Lieutenant, and eventually became the Commander-in-Chief of the navy. He also served as the Governor-General of the Lombardo-Venetian kingdom. Subsequently he retired to a private life, residing at the Trieste with his young bride Princess Carlota, the daughter of King Leopold I of Belgium. But, he continued with his study of natural sciences and in 1860 undertook a journey to the tropical forests of Brazil, in pursuance of his studies in Botany. It was during this trip that he purchased the two celebrated diamonds. In 1855 the Liberals took control of the national government of Mexico, after defeating the conservatives who were hitherto in control of the government. Most of the liberal politicians who were living in exile in the United States and other countries, including Benito Juarez returned to Mexico. Juarez was appointed as Minister of Justice in the new liberal government, and under his guidance three major reforms were carried out by the Liberals:- 1) Abolishing special courts for the clergy and the military 2) Enacting legislation forcing the church and the aristocracy to sell their enormous land holdings, in order to broadbase land ownership. 3) Adoption of a liberal constitution promulgated in February 1857. Under the new constitution Ignacio Comonfort was elected as the President of Mexico, and Benito Juarez was appointed as president of the Supreme Court, which according to the new constitution made him the effective vice-president of the country. The conservatives who lost their properties and privileges went into exile in the United States and Europe, but those who remained in Mexico, regrouped and revolted ousting President Ignacio Comonfort in 1858. Benito Juarez who had a legitimate claim to the presidency withdrew from Mexico City to the eastern port city of Vera Cruz, where he set up his government. At Veracruz, Juarez succeeded not only in keeping the liberals together, but was able to enact further legislation curbing the ecclesiastical powers of the clergy, and nationalizing all church property except those actually used for worship and educational purposes. The legislations culminated in the separation of the church and state, and guaranteeing religious liberty to all citizens. By the end of 1860 the position of the conservatives in Mexico City had become very weak, and in January 1861 Juarez was able to return to Mexico City, and was duly elected as president of Mexico. In the absence of a legitimate government in Mexico City for three years, the conservatives had emptied the treasury and the country was almost on the brink of bankruptcy. To overcome this critical situation Juarez suspended payment on all foreign debts for two years. This provided the license for foreign intervention, and Britain, France and Spain landed troops in Veracruz in January 1862, under the pretext of safeguarding their investments. But, France's intervention was more than safeguarding investments. Napoleon III had drawn up plans to conquer Mexico and colonize it, and install a puppet emperor from Europe, which unfortunately happen to be Ferdinand Maximilian Joseph. Britain and Spain withdrew their forces when they learnt of Napoleon's plans. 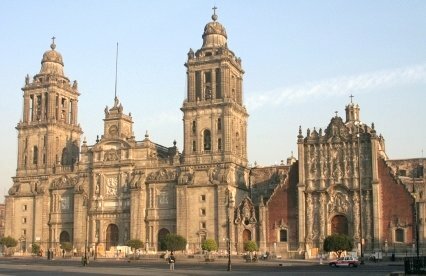 In June 1863, the French occupied Mexico City after defeating the Mexican forces. Juarez withdrew from Mexico City for the second time to the Texas-Mexico border. The first request for Maximilian Joseph to assume the throne of Mexico was made in 1859, by conservative Mexican exiles in Europe, who had lost their property and privileges and painted a picture of absolute anarchy in the country. Maximilian turned down this offer. However in 1863, after French forces had captured Mexico, under pressure from Napoleon III and requests made by the conservatives, who made him believe that the Mexican people had voted him their king, Maximilian Joseph consented to accept the Mexican Crown. Emperor Francis Joseph of Austria, who was Maximilian Joseph's brother, however advised him not to accept the offer. In spite of his objections Maximilian Joseph and his wife boarded a ship and landed at Veracruz on May 28, 1864. Subsequently on June 10, 1864, Maximilian Joseph was crowned as the emperor of Mexico. Emperor Maximilian who was not only a natural scientist but an enlightened leader and a great humanist, planned to rule his domain with great benevolence, and to protect and uplift the position of Indian peasants in the country. In this respect he was on par with Benito Juarez, the national hero of Mexico, who was born of Indian parents, and contributed a great deal to the social and political development of the Mexican people in general, and the Indian community in particular. Both Emperor Maximilian and Benito Juarez had a parallel vision for the future of the Indian community of Mexico. Accordingly, when Benito Juarez's sweeping political and land reforms came up for review, Emperor Maximilian upheld these reforms much to the indignation of the clergy, the landed proprietors, and other vested interests. In particular he antagonized the hierarchy of the Roman Catholic Church, by refusing to restore vast church holdings confiscated by Juarez. The Mexican treasury was almost empty, and Emperor Maximilian did not make use of the state resources for the up keep of his family and his palace. Instead he made use of his own inherited income for this purpose. 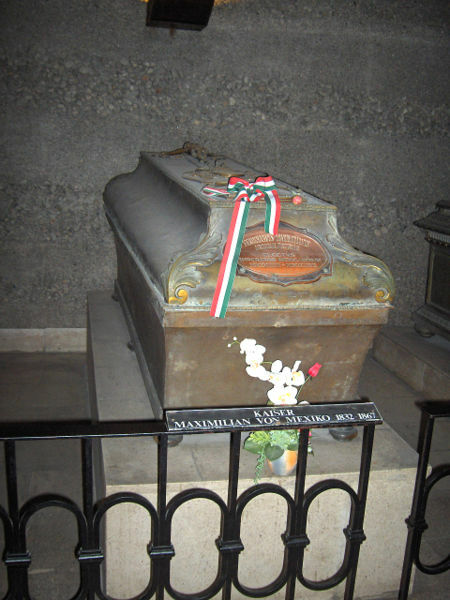 The honesty and integrity of Emperor Maximilian was another factor that was on par with Benito Juarez, who was said to be impeccably honest, and never used public office for personal gain. During the period of foreign intervention in Mexico, beginning from January 1862, Mexico's giant neighbor the United States of America, was in the midst of a devastating civil war (1861-65), and was indifferent to the dramatic events taking place inside its southern neighbor. However soon after the end of the civil war in 1865, the United States demanded the withdrawal of French troops from Mexico, as it violated the Monroe Doctrine, and in support of this demand amassed troops on the Mexican border. 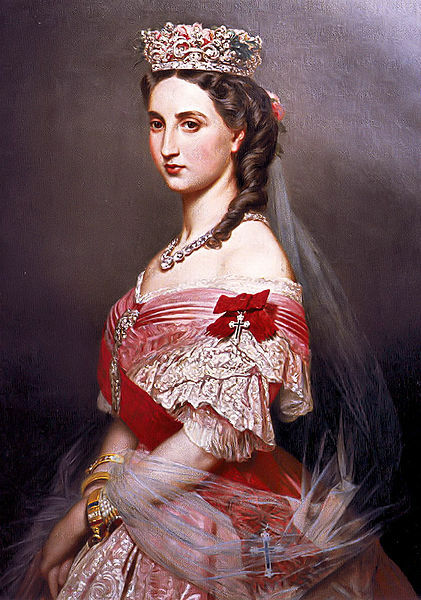 Princess Carlota rushed to Europe seeking help for her husband's kingdom, from Napoleon III and Pope Pius IX, but was of no avail. 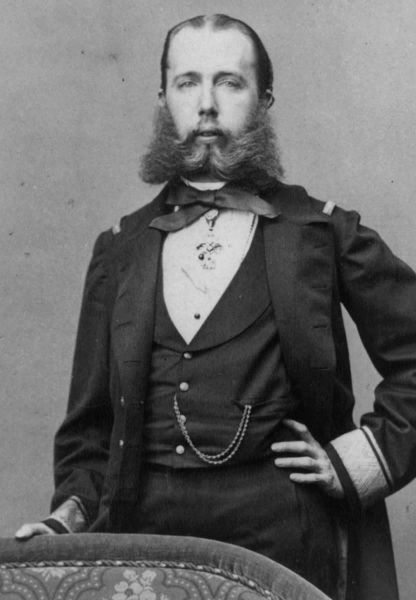 In March 1867, the French forces withdrew from Mexico, but Emperor Maximilian refused to leave with them, as he felt he could not desert his people. Within a matter of days Benito Juarez and his army was back in Mexico City. Maximilian refused to abdicate and was still supported by a group of diehard conservatives. Finally on May 15, 1867, Emperor Maximilian surrendered to the forces of Benito Juarez. Emperor Maximilian and two of his highest ranking generals Miguel Mira-Mon and Tomas Mejia were court martialed, found guilty and sentenced to death. Appeals for clemency from international figures like the novelist Victor Hugo, and Italian patriot and soldier Giuseppe Garibaldi, and other crowned heads of Europe, went unheeded. 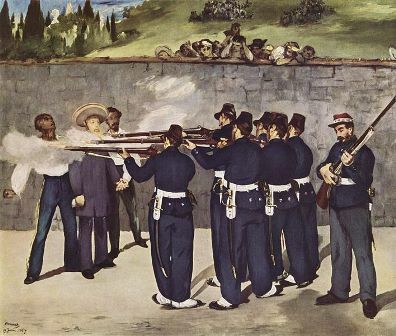 On June 19, 1867, Emperor Maximilian, who was only 35 years old, and his two generals were executed by firing squad on a hill outside Quere-taro. So ends the sad story of Ferdinand Maximilian Joseph who met his tragic end, by being a willing pawn in the international power politics, that served the ulterior motives of certain nations and their rulers. Soon after his execution it was discovered that Emperor Maximilian had been wearing the 41.94-carat diamond in a small satchel tied around his neck, when he faced the firing squad. After the execution the Emperor's body was returned to his family in Vienna, and the diamond given to his widow. The problems faced by her husband ever since he was installed as emperor of Mexico, that eventually led to his execution, and her desperate attempts in seeking help for her husband, which was denied by those who installed him as emperor, had a profound effect on Princess Carlota, which led to serious emotional collapse and severe mental derangement. The princess remained mentally deranged until her death near Brussels in 1927, almost 60 years after the tragic incident. The Emperor Maximilian diamond was sold in 1867, in order to pay for the medical expenses of the princess. Since then the whereabouts of the diamond was unknown, until it reappeared in America in 1919, when it was purchased by a Chicago gem dealer, Ferdinand Hotz. The Emperor Maximilian diamond was exhibited by Ferdinand Hotz, the owner of the diamond, at the Century of Progress Exposition in Chicago held in 1933-34. The diamond was the highlight of a $ 5,000,000 exhibit, which reproduced a South African diamond mine in operation with native laborers. During his ownership of the diamond since 1919, there had been several offers by interested individuals to purchase the diamond, but Ferdinand Hotz refused to part with it. However after his death in 1946, it was sold to an anonymous private collector in New York City. The Emperor Maximilian diamond then came into the possession of Laurence Graff, the King of diamonds, the founder of the internationally renowned Graff Diamonds, who is said to have handled more important gem-quality diamonds than any other living dealer. The last transaction of the Maximilian diamond took place in 1983, when the diamond together with the 70.21-carat Idol's Eye diamond and the 70.54-carat Sultan Abdul Hamid II diamond was sold to the same anonymous buyer, by Laurence Graff in one of the biggest single transactions in the history of diamond sales. According to rumors the three famous diamonds were actually purchased by Imelda Marcos the wife of the former President of the Philippines, Ferdinand Marcos. When Princess Carlota left Mexico in 1866 seeking help for her husband's cause from Europe, she left behind the 33-carat greenish-yellow diamond which her husband had presented to her, and which she wore as a pendant to a necklace. The diamond then disappeared for three decades, until it surfaced in 1901, when two Mexicans attempted to smuggle it into the United States. The diamond was seized by the US customs authorities, and subsequently put on auction in the same year, and was sold for $ 120,000. The diamond again reappeared in 1964, when it was purchased by the New York jeweler, Morris S. Nelkin. The diamond remained in Mr. Nelkin's family up to 1979, when one day a member of the Nelkin household suspected that a prowler was moving around in the house, and hid the diamond in a garbage pail, but forgot to retrieve it. The following day the garbage was collected, and the diamond was lost forever, in spite of an extensive search of the municipal garbage dump.